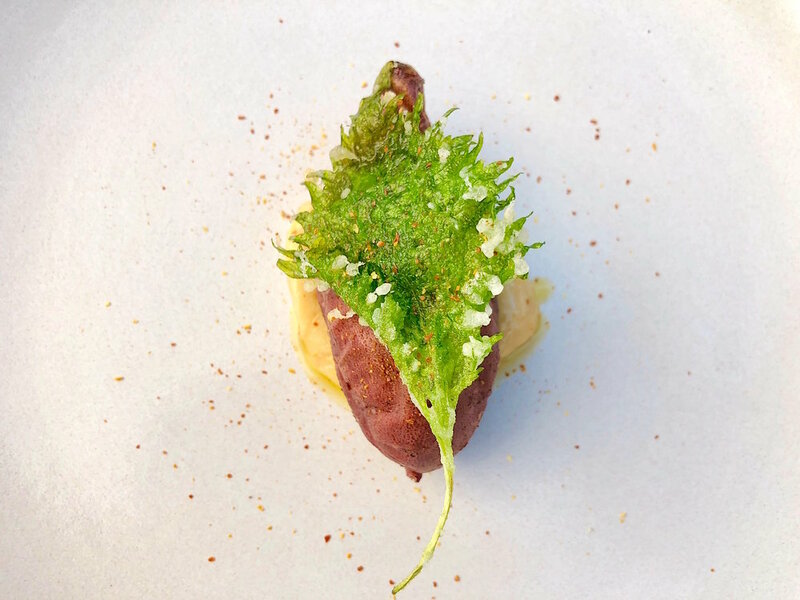 Cook on Your Feet is a blog by private chef Judd Servidio where he will show you how to make interesting and new recipes often with seasonal produce. Here is an easy middle eastern inspired carrot recipe that packs a punch in the flavor category. Dukkah is a middle eastern spice mix consisting of nuts, seeds, and spices. The recipe can easily be alternated with different nuts or spices to give you all kinds of different flavor profiles. It can be used on any kind of protein or vegetable so it is very versatile and pretty simple to make. In most cases you would roast all of the nuts, spices, and seeds and then coarsely grind together to make your spice mix. In this case I didn’t do that because I ended up roasting the spice mix with the carrots so I didn’t want the spice mix to burn, therefore I didn’t go with the traditional route for preparing the spice mix. Here is the recipe I hope you enjoy it! Place nuts in a food processor and pulse until the nuts are ground up fairly small but not into butter. Place all the spices and seeds into a coffee grinder and coarse grind. Then mix everything together really well with salt. Preheat oven to 400 degrees. Take your carrots and cut them all in half after they have been washed and cleaned. Then take a small bowl and pour in olive oil and 3-4 tbsp of dukkah, mix well. Then on a sheet pan lined with parchment paper spread our the carrots. Take your olive oil-dukkah mixture and spoon all over the carrots generously. Season the carrots with a sprinkling of salt and then place them in the oven for 25 minutes. The dukkah should toast and almost become crunchy during the roasting process. It adds a nice contrast to the finish carrots which become soft when cooked. Simply place all of the carrots on the plate. Take the dukkah that has become crunchy on the sheet pan and place all on top of the carrots (if it has fallen off). Take diced up pieces of manouri cheese and place around the carrots. Finish with a little drizzle of olive oil and dill sprigs. Serve and enjoy! ( An alternative could also be to take 3 tbsp of dukkah and mix with 1/2 cup of yogurt and place that underneath the carrots as a “sauce”). This was wild mexican sea bass or corvina. Very popular in latin america but not as popular stateside. This look like a great piece of fish so I decided to go with it. Very simply prepared with just sauteing the fish and pairing it with a spicy tomato sauce. I added the artichokes to this dish and it turned out to be a very good dish. Here is the recipe I hope you enjoy it! Take the artichokes and pull off the outer tough leaves (wearing gloves helps you not to get pricked). Then take a pairing knife, cut off the tops and trim the bottoms of the green outer skin trying to keep the stem intact. Trim the stems as well of all the green tough skin. Immediately take one half of a lemon and wipe the artichoke all over to stop the oxidation process. Place in a pot filled with water, white wine, and 1 lemon juiced. Continue until you have all the artichokes peeled. Then add the rest of the ingredients along with salt. Take a piece of parchment paper and cut a large square. Then fold it over in half and then in half again. Then fold it diagonally into a triangle. Then fold two more times continuing the triangle. Then cut the point of the triangle off and cut around the outer edge to fit the size of the pot. Open the paper up (This is called a Cartouche), the paper should be a round circle that fits inside the pot with a whole in the middle of the paper. This is basically a lid for the artichokes to keep them submerged under the water. Bring the pot up to a slowly to simmer, where the water is just barely bubbling. Cook the artichokes until they are just tender all the way through. Test the artichoke with a cake tester to check the doneness. Take off the heat and let the artichokes cool to room temp. Preheat grill until hot. Then take your tomatoes and char them good so they have a nice blackened exterior. Then place the tomatoes in a small pot with water and ssamjang. Bring to a boil and turn down to a simmer. Cook for about 15-20 minutes and then puree in a vitamix. While the blender is running add the butter. Adjust the seasoning with salt if need be. Set aside and keep warm. In a saute pan on medium high heat add oil. Season the corvina with salt on both sides and place fillet side down in the pan. Cook for 5-6 minutes on that side and then add the butter. Meanwhile in a large saute pan heat your artichokes up until hot. At this point turn the fish over and cook for 1 minute and then take out of the pan. Place a spoonful tomato sauce on the plate. Add the artichokes next to it. Place the fish on top of the sauce and garnish with mustard greens. Serve and enjoy! Here is a classic chocolate eclair filled with vanilla cream. If it were a donut fan you might recognize it by the name boston cream. There is something comforting about having a little chocolate paired with custard and of course a little carb. Sometimes there is nothing better than a classic recipe and in this case a delicious pastry. Have it for breakfast, or in the middle of the day with a coffee. Doesn’t really matter when you have it because it all tastes great going down. To me the pate a choux dough is one of the easiest to make and very versatile. You can bake it, fry it, or steam it or boil it. In this recipe it is simply baked, filled with custard, and topped with chocolate. Here is the recipe I hope you enjoy it! Preheat oven to 400 degrees, In a small pot add milk (or corn juice), butter, sugar, and salt. Bring to a simmer. As soon as the butter has completely melted stir in the flour with a wooden spoon and turn down the heat to low. Incorporate all the flour thoroughly and cook for about 1 minute. Transfer the dough to a stand mixer with a paddle attachment. Turn on medium speed for a minute and then turn down to low speed. Crack the four eggs into a measuring cup and add them to the dough one at a time. Make sure the egg completely incorporates before adding the next egg. Continue until all the eggs have been added. Then take the dough and place in a pastry bag fitted with a french star tip. On a sheet pan lined with parchment paper pipe small straight lines of the dough. 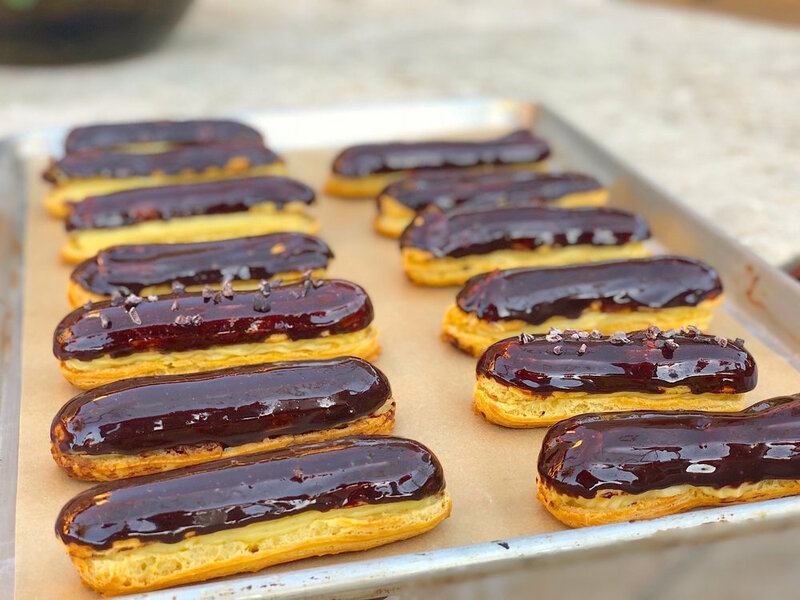 ( if you have any parts of the dough that sticks up you can wet your finger with water and push it down without it sticking to you or looking bad) Once the sheet pan is full of the eclair shapes, place in the oven and immediately turn down to 350 degrees bake for about 30-35 minutes until light brown. Then turn down the oven to 325 and bake for another 15 minutes. Take out and let them cool completely. Scald the milk and vanilla bean in a medium sauce pot. Turn off the heat when the milk starts to a boil. Beat the egg yolks and sugar in a food set to high, until the eggs and sugar form pale white ribbons. Add the flour to the eggs and beat for 30 seconds. Temper the eggs by whisking in one ladle of milk at a time until all the milk is incorporated with the egg and flour mixture. Place the egg mixture back onto low heat and whisk continually to thicken the pudding. Allow about 10-12 minutes, but don't boil. Once it has thickened finish by whisking in the cold butter. Pour the pudding into a bowl through a fine mesh strainer. Place a piece of plastic wrap on the surface of the pudding so it doesn't form a skin, place in the refrigerator. Leave the vanilla bean in the pudding until everything has cooled, then discard the bean. In a small bowl bloom gelatin powder in 3 tbsp of water. Place sugar, water, cocoa powder, and cream in a pot and turn on medium heat. Stir regularly until it comes to a boil. Then add in the chocolate. Stir until completely combined. Then add in the gelatin and stir until smooth. You can use the glaze immediately if you want but I found that I needed it too cool a bit because if it is too hot you have to glaze the tops multiple times or else the glaze will be too thin on top of the glaze. So I allowed it to cool almost to the point where it thickens ups but doesn’t set. Cut the eclairs in half lengthwise, then take a pastry bag with a plain tip and fill with pastry cream. Pipe pastry cream to fill the bottoms of each eclair. Then take the tops and dip in the chocolate glaze (you can place them on a rack to dry slightly. Then place the tops carefully on top of the pastry cream filled eclairs. Top with cocoa nibs if desired. Place in the refrigerator for at least an hour. Serve and enjoy! Spring has sprung and this is a recipe that showcases just 3 ingredients. Chanterelle mushrooms which I simply roasted in a wood oven (green egg). Sauteed some earthy chrysanthemum greens and made a vibrant spring garlic (green garlic) oil. That is basically the gist to this appetizer. Keeping it simple with all that spring has to offer. You can easily add a fish or steak to this recipe for a more substantial meal. Here is the recipe I hope you enjoy it! Simply chop green bottoms and tops to spring garlic. Then place the green garlic in boiling salted water for 45 seconds and then shock in an ice bath. Squeeze dry the green garlic and place in a vitamix with the oil. Puree for 30 seconds to a minute. Then strain through a chinois ( if you want no sediment in the oil at all use a cheese cloth as well) Season with salt and place in a squeeze bottle. In a saute pan add butter, oil, and mushrooms. Season with salt and pepper and roast in your wood oven (egg) for 10- 15 minutes or until tender. Meanwhile in another saute pan add butter, oil, and chrysanthemum greens. Cook for 1-2 minutes until they are tender and lightly wilted. Season with salt and pepper. Add some of the greens to the bottom of a bowl. Then take the mushrooms out of the oven and place on top. Drizzle green garlic oil around the bowl. Finish the plate by garnishing with radish flowers and green garlic slices. Serve and enjoy! Here is a super easy snack that I through together at the last minute for a recent dinner. I bought these tiny japanese white sweet potatoes at the santa monica’s farmers market along with shiso. I already had my big green egg fired up so I thought why not roast them in the egg and fry up some shiso (japanese mint) for garnish. I had already made a batch of confit garlic-miso puree from the week before so I knew that would be a great vehicle to round out the dish. Add a little spice with togarashi pepper and you have a perfect vegetarian-vegan friendly appetizer that anyone should love. Here is the recipe I hope you enjoy it! Place both garlic cloves and oil in a small pot. Bring to a simmer and then turn down low. Cook the garlic for 30-45 minutes until the garlic has turned lightened golden brown (not dark). Take off the heat and cool completely. Simply drizzle sweet potatoes with olive oil and salt. Place in your green egg for about 45 minutes or until soft and tender. Meanwhile in a small bowl mix soda water, rice flour, and cornstarch together with a whisk (the batter should be fairly thin, we aren’t looking for a thick batter at all. It should be a little thiner than a crepe batter). Place a small pot with 1 1/2 cups of frying oil (vegetable) in a pan and bring to 325 degrees. Dip each shiso leaf into the batter and then place in the fryer. Cook for 20-30 seconds on each side and then strain out and season with salt and togarashi pepper. Simply place a spoonful of the miso-garlic puree on the plate. Then add the sweet potato on top. Finish with shiso leaf and more togarashi. Serve and enjoy this simple sweet potato recipe. Here is a great spring salad with that I served the other night that started off the four course birthday dinner for a good friend of the Dejoria’s. This salad is really just reaping the benefits of the local farmers markets. I normally get this fresh jalapeno sheep’s milk cheese that is creamy and little bit spicy. Fresh baby globe carrots and english peas. I gave a little crunch to the salad with candied spiced pecans. It was absolutely enjoyed by everyone that night. Definitely a keeper for the recipe file. Here is the recipe I hope you enjoy it! Bring a pot of salted water to a boil. Add 2 cups of english peas. Cook for 3 or so minutes until the peas are tender all the way through. Strain out the peas and place into a ice water bath. Meanwhile take a little cream and heat bring to a boil in saute pan. Take 1 1/2 cups of peas and place in a vitamix with basil leaves. Pour the warm cream over the peas and season with salt. Puree until smooth and then strain through a fine mesh sieve (chinois or tammi). Set aside and keep at room temperature. This is a quick way to make candied nuts. In a small bowl add water, powdered sugar, salt, and graham marsala spice. Mix well with a whisk. Then add the pecans and coat well with the sugar glaze. Then place on a sheet pan lined with silpat or parchment paper. Place in the oven and bake for 15-17 minutes or until golden brown and dry (stir or shake the pan every 5 minutes to ensure even baking). Take our and allow to cool completely. Then place in an airtight container. I used the my big green egg and roasted them in that. You can roast on your grill or wood oven or standard home oven. Place spices in a coffee grinder and coarse ground the spices. Then take your carrots and toss with olive oil, salt, and spice mix. Place on a sheet pan lined with foil (if you using a grill I just keep them in the foil and cook them like that) and place in your oven if not grilling. Cook for 25-30 minutes at 400 degrees or until the carrots are tender. Take out and allow to cool to room temperature. Take a large round cookie cutter and place on the plate. Add some of the jalapeno cheese and spread on the bottom of the plate. Then take the pea puree and spread evenly on top of the cheese. Take some of the carrots and place on top of the puree. Place the baby greens and peas in a small mixing bowl. Drizzle the white balsamic and olive oil on top of the greens and peas. Season with salt and pepper. Then add that on top of the carrots and puree. Add the candied pecans and more carrots and peas on top. Finish with radish flowers. Serve and enjoy! Add all the liquid (vinegars) to a small pot and bring to a boil. Meanwhile place all the chopped vegetables in a heat proof boil or container. Once the pickling juice comes to a boil pour over all the vegetables. Then add salt, zest, and chili flakes to season. Wait about 20 minutes and then add the chopped dill and olive oil(this will hopefully give enough time to allow the mixture to cool a bit so the dill won’t turn brown. Taste and adjust seasoning with salt if need be. Set aside and keep warm. Place celery root and potato in a small pot. Fill with water and 2 tsp of salt. Then bring to a boil and turn down to a simmer until potato and celery root are tender. Strain off the water add cold butter, milk and puree until smooth. Season with salt and pepper and keep warm. In a large saute pan on medium heat add oil. Take sea bass and season with salt. Place the sea bass fillet side down. Season the bottom side of the fillet with salt and black pepper now too. Cook for 6-7 minutes on the one side. The fish should be cook almost all the way through on the one side. The fish should form a natural golden brown crust. Then turn over and cook for 1 more minute. Turn off the heat and allow the fish to rest in the pan for another minute. Meanwhile add a large spoonful of the celery root puree. Add the fish to the plate. Then spoon over the fish the warm asparagus conserva. Drizzle with a little extra olive oil if desired and a little extra dill. Serve and enjoy! Here is a simple dessert utilizing the winter limes we get here in Malibu. We actually have multiple varieties of citrus growing at this property and I actually used sweet limes for this recipe. Sweet limes are still sour, like limes, but with a hint of sweetness. This recipe is something that can be thrown together in a day but the results might look and taste like you spent days working on it. Here is the recipe and I hope you enjoy it! Place water, sugar, glucose and milk powder in a pot and bring to a boil or until all the sugar has dissolved. Pour that into a bowl fitted within a ice bath to cool. Once cooled add yogurt, lime juice, and a pinch of salt. Blend with a hand blender to mix well. Then place back in the ice bath or refrigerator for another 30 minutes to make sure it is very cold. Then put into your ice cream maker. Once done put into a container and place in the freezer. Place all the ingredients into a small sauce pot and turn on medium low heat. Whisking continually until the curd starts to thicken. Should take about 10 minutes or so. Strain into a bowl and place in the refrigerator to cool down. After its cool place into a squeeze bottle or pastry bag. Using an electric mixer beat butter until soft and fluffy. Add granulated sugar and salt and mix well. Then add the flour in 3 stages until just blended. Take out the dough and form into a using parchment paper and cool in the refrigerator for 45 minutes. Then take out and slice into 1/8 inch thickness. Then place in the oven and bake until golden brown about 13-15 minutes depending on how big of cookies you cut. Take out and allow to cool. Simply place your egg whites in a stand mixer with a pinch of sugar. Whisk on high speed after a minute gradually add your sugar. Keep whisking until you have siff peaks and shiny anbout 4 mins. Place in a pastry bag with a plain tip. Line a sheet pan with parchment paper and pipe small rounds ( I did small and tiny ). Place in the oven and bake for an hour, then take out and let it completely dry for 5 minutes. Then take out and place in an air tight container. Then when ready to plate you can place them in plastic bag and smash them all up. Simply place a spoonful of curd inside the bowl. Add raspberries next to the curd. Add a scoop of sorbet on top of the berries. Place a one or two shortbread cookies next to the sorbet. Finish with crushed up meringue all around the bowl. Serve and enjoy this light, refreshing, and easy dessert! Still on my pasta kick after a few months ago getting back from Italy. This recipe is celebrating the different squashes during the winter months. I made a soup with butternut squash and made the filling for the pasta with carnival squash. 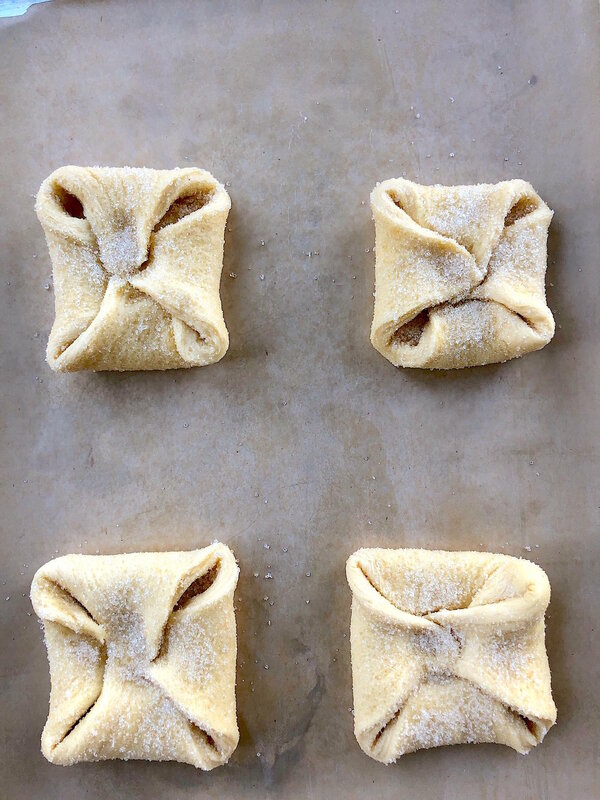 I decided to make another pasta shape Scarpinocc. It is a fun shape to make and probably will take a few extra minutes to shape. It originates from northern Italy, Scarpa, which translates into shoe, though to me it doesn’t really resemble a shoe but who am I to judge. The pasta shape isn’t hard to make at all you start off with a rectangular shape and place your filling ( in this case squash and cheese) then you fold over the pasta once over the filling and then one more time to seal it. You pinch both sides of the rectangle and then using your finger make a little dimple in the top of your filling. Unfortunately I am not a very good blogger because I don't have a video out there to show you but I think there are some online. I do have a picture of the raw shape along with some other shapes of pasta. Here is the pasta recipe I hope you enjoy it! Place roasted carnival squash, ricotta, parmesan cheese, and basil, into food processor along with salt and pepper. Puree until the mixture is completely smooth. Then place into a pastry bag with a plan tip. Place in the refrigerator for 30 minutes to firm up the filling slightly. Place 2 cups of flour and 1 cup of semolina in a bowl. Make a well in the center of the flour. Add eggs, yolks, water, and salt. With a fork stir the egg mixture until it starts to form a ball of dough. Then use your hands to form the dough. Add more flour if the dough is wet. Knead the pasta for 5 minutes and then cover and rest for at least 30 minutes. In a small sauce pot add butter and onions with a pinch of salt. Cook for a few minutes and then add roasted garlic and roasted butternut squash. Add the chicken broth and bring to a boil. Turn down to a simmer and cook for 15 minutes. Place in a vitamix and puree until smooth. Season with salt and pepper and keep warm. Place a pot of boiling salted water on. In a large saute pan add 2 tbsp of olive oil and butter. Slice roasted sunchokes and add to the pan. Place scarpinocc pasta in the boiling water and cook for 2 minutes. Then strain out and pasta and place in the saute pan with the sunchokes. Season with salt and pepper. Then in your bowl add some of the butternut soup. Add a few pieces of the pasta with the sunchokes. Top with some fresh parmesan cheese. Drizzle with pumpkin seed oil and seeds. Top with sunchoke chips and chives. Serve and enjoy! Here is a simple dish that really turned out amazing. A few good ingredients that are executed correctly and that is what good cooking is all about. The key to this dish is really cooking the onion to where the onion is cooked all the way through with it still upholding its structural integrity. This is a great vegetarian appetizer that will really be a crowd pleaser. Here is the recipe I hope you enjoy it! Place onions and wood chips on a sheet pan lined with parchment paper. Drizzle onions with olive salt and pepper. Place in a 350 degree oven for 30-40 minutes or until just tender all the way through. Take out and allow to cool to room temperature. Once cooled peel the outer layers of the onion and save for the puree. Reserve for the onions for later. Place peeled outer layers of the onion into a vitamix. Puree until smooth with 2 tbsp of butter. Season with salt and keep warm. For the green olive puree (tapanade) place olives and garlic into a food processor. Puree and add the oil during the process. No need to season because of the saltiness of the olives. Take slices of sourdough bread and take a round cookie cutter just a hair bigger than the onions and punch out 8 rounds. Set aside until ready to serve. If the cipollini onions are really big you can cut then in half width wise (think of an orange cutting it on its side to have two perfect sides of the fruit). Otherwise you can trim the tops and bottoms if need be. Season the onion with a little salt on both sides. Then add a few spoonfuls of the green olive puree on top of one side of the each onion. Place the round sourdough on top of the green olive puree. Then take a large saute pan and add 3 tbsp of butter and 3 tbsp of olive oil to the pan. Place the onions face down so the sourdough is in the pan and you are looking at the onion. Cook for 3 minutes and then place in a 400 degree oven and cook for 5-7 minutes. Take out and flip over and let them rest for a minute in the pan. While they are resting place a spoonful of the onion puree in the middle of the plate. Then take aged balsamic and drizzle around the plate. Take the onion out of the pan and place right on top of the puree. Top the onion off with a touch of salt and micro greens. Serve and enjoy! Here is a great salad using peppers from the farm in Michigan Sunset. One of the largest green house organic farms in the country. They also have amazing strawberries. My boss had made a stop at this amazing farm and brought back cases of both ingredients. Strawberry season is just starting for some states and spring is almost here. So I decided to share this strawberry and pepper salad to get us ready for that warmer weather. This was a salad that both Jp and Eloise absolutely loved!. There is obviously some sweet to this dish but there is also acid and heat. This gives the dish a well rounded flavors that really worked well with one another. Here is the recipe I hope you enjoy it! In a small pot add 1 tsp of oil with onion and jalapeño. Cook for 2 minutes and then add the rest of the ingredient. Bring to a boil and then turn down to a simmer. Cook for 10-15 minutes or until the mixture has thickened and holds together. Turn off and allow to cool to room temperature. Reserve for plating. Add a spoonful or two of the chutney onto your plate. Then some of the roasted peppers on top. Add the diced avocado and season with salt. Finish with radishes and strawberries. Season everything again lightly. Then garnish with micro cilantro and a drizzle of olive oil. Serve and enjoy! Here is one of my wife’s favorite cookies when we end up spending summer time on the west coast. We have a few favorite bakeries that do a great job of making the delectable cookies. 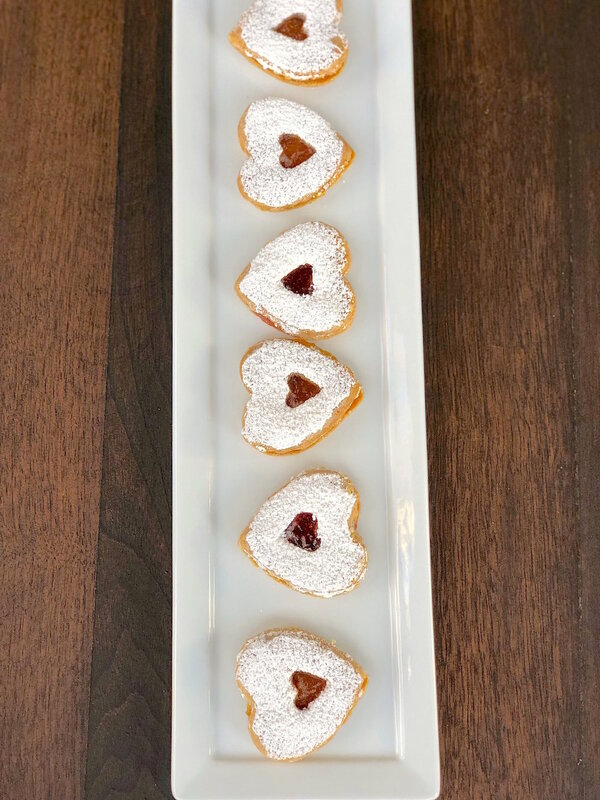 I think these cookies started in Austria, but what inspired me to make this recipe other than my wife loving them; was the fact that I was taking a flight back to Austin and they had a documentary on European baking traditions around the holidays. And to me it was really interesting to see how shortbread is made all over the world and how versatile it is as well. Just a few simple ingredients of butter, sugar, and flour can be the start of something wonderful. I took it a step further by using some of my jams that I had made from the summer fruit. Here is the recipe I hope you enjoy it! Using an electric mixer beat butter until soft and fluffy. Add granulated sugar and salt and mix well. Then add the flour in 3 stages until just blended. Take out and form into a round disk. Wrap in parchment paper and cool in the refrigerator for 45 minutes. Then take out and roll the dough into 1/8 inch thickness. Dust your board with flour if you need to. Then using a heart shaped cookie cutter cut out cookies and place on a sheet pan lined with parchment paper. Continue the process until you have all the dough cut out. Then take a smaller size heart shaped cookie cutter and cut the middle out of half of the cookies. Then take your jams and fill the bottoms without the small heart shaped cut out. Then dust the tops of the cookies with the small heart shape cut out with powder sugar. Place that on top to sandwich the cookies in between the jam. Continue the process until you have all the cookies finished. Serve and enjoy! Here is a take on the classic recipe tortellini en brodo. My version is without pork and doesn’t have chicken in the broth but don’t let that fool you that this isn’t as good if not better than the original. This is a straight forward recipe using ground wagyu beef to make a meatball stuffing. Then placing the tortellini in smoked beef broth and topping it with a little fresh parmesan. Grind the meat yourself making sure you have ice cold attachments for your meat grinder or have your local butcher grind it for you. (short rib is an expensive cut to grind so you might want to use a less expensive fatty cut like brisket, chuck, or round). Add all the other ingredients to stainless steel bowl and season. Take a small saute pan on high heat with a tsp of olive oil and cook 1/2 oz of the meatball mixture. Taste the meatball to see how it tastes. If everything tastes perfect then set aside for the pasta, if not adjust the meatball to what you think it needs. Take your pasta and cut in half. Leave one half covered while you work with the other half. Take the half of the pasta with a rolling pin and roll until the dough is thin enough to fit inside the biggest setting on your pasta machine ( I use the kitchen aid attachment). Then run the pasta all the way down to the lowest setting twice. Dusting the dough with flour if it is too wet. Then on the third time run it down to the number 6 or 7 setting depending on the strength of the dough. Again, Use a little flour for dusting. If you feel like the dough is very strong and good density to it you might be fine with a 7 setting. If you feel like the dough is "loose" and doesn't have the structure to it then you might want to go a little thicker with a number 6 setting. One you have the flat pasta all laid out you can take an adjustable pasta cutter (here) and cut 1/2 by 1/2 inch squares. Fill each pasta with just a small amount of meatball filling. Brush each one with water and then fold over into a triangle, then pinch the ends together to make a tortellini shape. Place on a sheet pan lined with parchment paper. Place a pot of salted water on the stove and bring to a boil. Place another pot on medium heat with the bone broth. Place 20-25 tortellini pastas in the water and allow to cook for 2 minutes. Strain out and place in the sauce pan with the beef broth and cook for another minute to finish cooking the tortellini’s to al dente. Adjust the seasoning with salt and pepper if need be. Then portion the tortellini en brodo in 4 bowls. Top off with parmesan and chives. Serve and enjoy! Here is a simple dessert that will take you no more than 30-45 minutes to make. Super easy and not a ton of ingredients. The cake is a classic sponge that is light and airy. The filling is rich with the addition of nutella but the end result is something everyone will absolutely enjoy. This for me is one of those desserts that can be pulled off quickly if you are in a pinch or want to make something that doesn’t require a ton of time. Here is the recipe I hope you enjoy it. Place eggs, yolks, and 111g sugar into a stand mixer. Whisk until thick and pale yellow about 5 minutes. Then add the flour, hazelnut flour, frangelico, and a pinch of salt to the egg mixture and mix well. Then pour the mixture into a large stainless bowl. Clean out the mixing bowl and then place egg whites into the bowl. Whisk egg whites until triple in volume and then add the 3 tbsp of sugar. Whisk until stiff peaks and add. Then fold the egg whites into the egg-flour mixture in 3 parts. Pour the batter onto a sheet pan lined with parchment paper and smooth surface with offset spatula. Place in the oven and bake for approximately 10 minutes or until golden brown and cake tester comes out clean. Take out and let it cool completely. Meanwhile in a stand mixer bowl place cream cheese and whip with a paddle for 1 minutes. Then add the nutella to the bowl and whip until smooth (about another minute or so). Once the sponge is completely cooled take a piece of parchment paper the same size as your cake. Lightly sprinkle paper with powdered sugar. Flip the hazelnut sponge cake over onto the sprinkled parchment paper. Peel back the parchment paper that is now facing you from the bottom of the cake. Then take an offset spatula and add an even layer nutella cream cheese spread on to the sponge cake, leaving about an 1/2 border all around the sponge cake (option cut cake in half to make two smaller rolls) Then roll the sponge cake up and keep it wrapped in parchment paper and place in the refrigerator for at least an hour. 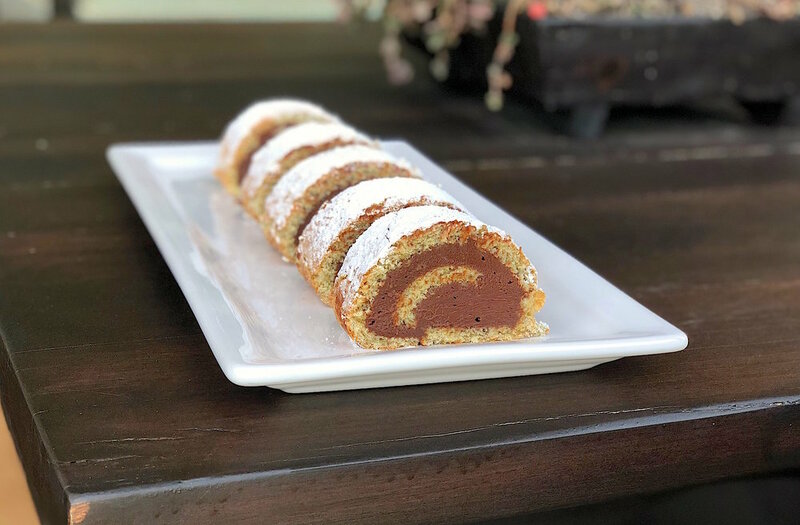 Simple dust the top of the nutella roll with powdered sugar, slice and serve! Here is the classic french onion soup recipe. This is with a vegetable stock and you would never know it by the taste. The caramelized onions is what marries together with the vegetable stock along with a few splashes of worcestershire gives you an illiusion of meatiness to the soup. No frills, no secretes, no long recipe, this is just straight forward easy to follow and great for those cold winter nights. Here is the recipe great for vegetarian dinners and even the meat eaters won’t know the difference! Place all the ingredients in a pot and bring to a boil, turn down to a simmer and reduce by half or until the stock (water) taste flavorful. Strain out and season with salt. Add oil and butter to a soup pot along with all the sliced onions. The key here is to not add salt to the onion (that would draw out the water in the onion) and let the sugars in the onions caramelize completely. They should be dark caramel in color without burning. Once they have all cooked down (25-30 minutes) add salt to the onions and your vegetable stock. Bring to a boil and then season with worcestershire and salt and pepper if need be. Simply place soup in bowls add a piece of toasted sourdough and grate gruyere cheese over the top. Place in the broiler until the cheese has browned and melted. Serve and enjoy! Here is an appetizer I made recently from chicken livers. JP loves chicken livers but for me, chicken livers aren’t my first choice. I don’t mind the flavor of chicken livers if it isn’t too strong. The best chicken liver mousse I ever had was in London at The Laytmer. This was so light and airy with a mild flavor that it was hard to stop eating it. Now foie gras (duck or goose liver) is a whole other category and I have no problem eating it. This really turned out well and you would of never known that it had mascarpone in the recipe, (which is optional). The amount of butter in this recipe gives the mousse a Chicken Foie Faux flavor because of the amount of fat being added to it. Don’t worry that the amount of butter in this recipe because this makes a large bowl full of mousse. And you only put a few dots of mousse on each tuile. Here is the recipe I hope you enjoy it! Place all the peppers including the seeds if you want it really hot into a food processor. Puree for 15-20 seconds. You want to puree until the peppers are a small diced size, don’t puree to mush. Add the peppers to a pot with water and sugar. Bring to a boil and then turn down to a simmer. Cook for 10 minutes and then cool to room temperature. Place all of the ingredients in a bowl and mix well. Then place in the refrigerator to chill for 20-30 minutes. Preheat oven to 350. I used an old silpat that had been worn down and using a cookie cutter cut out a round template out of the silpat. You can use other things as a template but this works well. Line a sheet pan with a silpat and place the template on top. Using a off set spatula take a little bit of the of the tuile batter and spread in a small layer inside the template. Smooth all over and then remove the template, you should be left with a circular dough on the lined sheet pan. Continue the process until you have 6 or so on the sheet pan. Then place in the oven and bake for 8-9 minutes. Take out and allow to cool completely. Then place in air tight container. Clean chicken livers of any sinew and place them in a bowl. Pour the milk over them and let them soak for an hour or two. Then strain off and pat dry with a paper towel. Season with salt and pepper. Using a medium saute pan on medium heat and 2 tbsp of butter and the chicken livers. Cook for 2-3 minutes and then flip over. Add the shallots and cook for 2 minutes. Deglaze with the cognac and reduce by half. Then add the cream and reduce by half. Pour all of the ingredients into a vita mix and puree until smooth. While the blender is still running add the butter to the liver puree. Now you can stop here and the mousse would be a typical recipe. I actually over salted mine a touch and wanted a little lighter tasting liver flavor so I added the mascarpone to lighten and make my flavor just right because of my heavy hand with salt. Place in a bowl and chill for at least 4-6 hours or best overnight. Place liver mousse in a plastic pastry bag. Take a tuile and spread a little hatch jam on top. Pipe dots of chicken liver mousse all over. Finish with radish, herbs, and flowers. Serve and enjoy! Here is the pastry that Dominque Ansel made famous here in America. Although this isn’t his recipe exactly it does come out amazing. This is basically the croissant dough from the bouchon bakery book with the addition of the Dominique’s technique for rolling out the kouign-amman. One of the differences between the two recipes is in Dominque’s recipe he uses bread flour instead of all purpose and I don’t think he makes a poolish for his as well. The bouchon bakery book doesn’t have a recipe for kouign-amman but it is basically the croissant dough rolled up with sugar and baked in a muffin pan. Dominique bakes his on a sheet pan with a ring mold. I used a large muffin pan to allow for maximum rising in the cooking process. Here is the recipe I hope you enjoy it! Mix the flour and yeast in a bowl. Pour in the warm water and mix well. Cover with plastic wrap and let it ferment for 12-15 hours. Add warm water to the poolish to help release it from the bowl. Using a spatula or scraper pour the poolish and water into a stand mixer bowl. Combine the flour, sugar, and yeast in a bowl. Then pour the mixture into the stand mixer bowl. Add the butter and with a dough hook mix well until the dough is formed about 2 minutes. Then add the salt and continue to mix about 10-15 minutes. 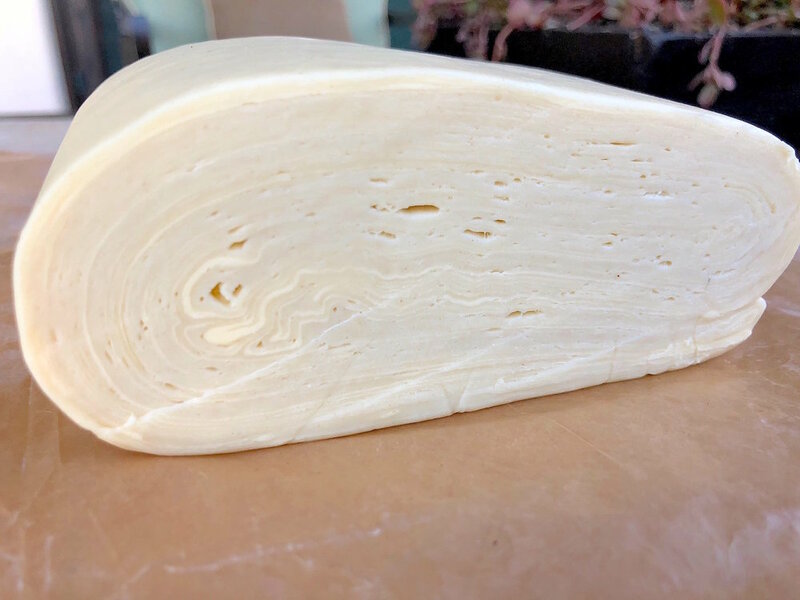 Once the dough is made, place on the your counter top ( try to resist from dusting with flour your counter top or cutting board) Roll the dough out to a perfect rectangle that is the same height as the butter block. Take out your butter and remove from the plastic back by cutting with scissors down each side of the bag ( now it is key to have your butter cold, but I think it helps the dough by having it cold but not too cold) I took mine out a few minutes before I locked in the butter. Place the butter block in the middle of your rectangular dough. Fold the left side of the dough over the butter and then ends should come just the edge of the butter. Then fold the right side like a book over the left side so it should look like a folded book. You want to pinch the seams so that no butter can escape the dough. Then turn the dough 90 degrees and roll the dough again out into a rectangle. The fold the dough like a book again and place in the refrigerator for 20-30 minutes until cold. Then repeat this process 2 more times. Once you have turned and chilled the dough 3 times this is when your dough is ready. 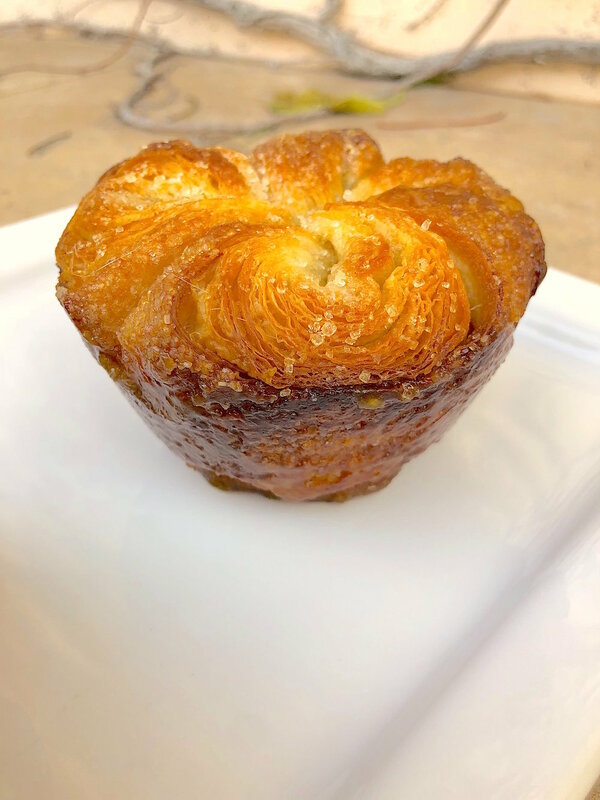 Now you can make Kouign-Ammans from the whole batch of dough and it will roughly make 12-16 depending on how big you want to make them. I cut 1/3 of the dough and made just 4 decent sized Kouign-Amman from it. The rest I used for croissants which will be in a post coming soon. So once you have your dough turned 3 times take your dough (1/3 for me) and douse your cutting board with about a cup of sugar. Spread it all over your cutting board (think of it as your bench flour and us it heavily), if you are like Dominique here you can’t use enough sugar . 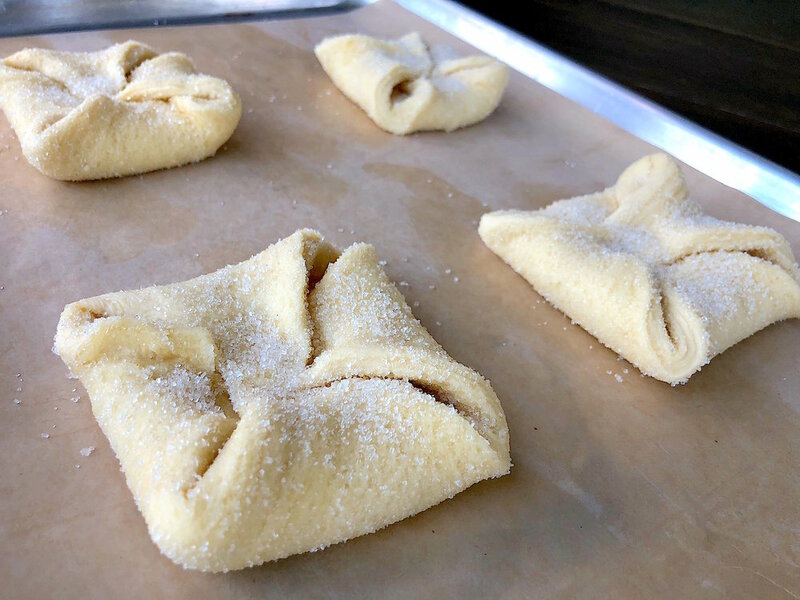 Then roll the dough out into a nice square, flipping the dough over a few times insuring that both sides get plenty of sugar rolled into the outside. Once you have rolled a nice square dough cut it into 4 large squares. Then douse each square with more sugar. Then take the four corners and bring them to the center each time pushing down hard into the center making sure the corners don’t pop up. Sprinkle with sugar once more on the top of the kouign-amman. Then spray a large muffin pan with non stick spray. 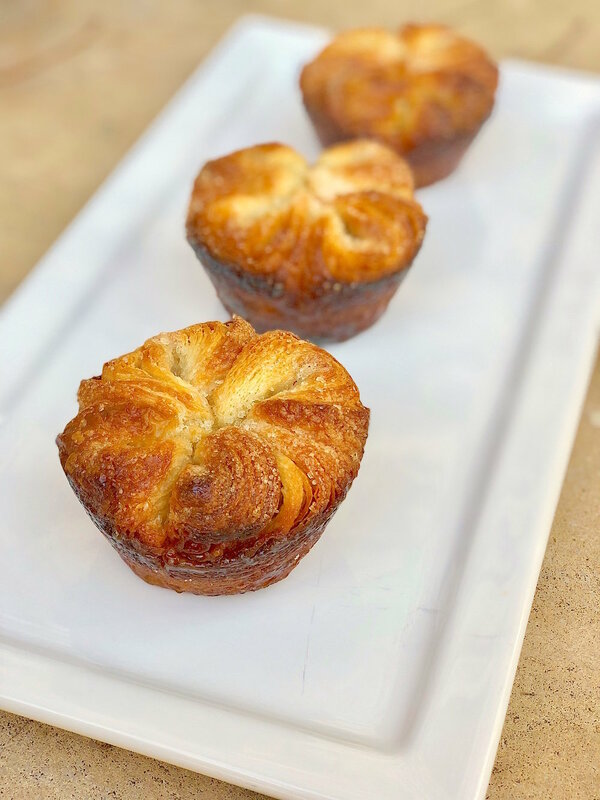 Place each kouign-amman inside one muffin slot until you have all of them in the muffin pan. Cover and allow to rise for 20-30 minutes. Preheat Oven to 365 degrees. Place the kouign-amman in the oven. Bake for 15 minutes and then rotate the pan. Cook for another 15 minutes and then rotate again ( they should be getting close to being done, cook until golden brown, mine took another 5 minutes or so because they were big) Once you take them out of the oven turn them out onto a parchment paper lined sheet pan and allow to cool up side down for 5 minutes. Once you have allow the outside caramel to cool and harden you are good to go on eating them. Serve and enjoy! This is a fantastic dish for anyone who loves meatballs and spice. And who doesn’t love that? Harrisa paste is a typical north African mixture of chile’s and spices. These flavors go perfectly with lamb and tomato. The yogurt is the compliment that cools your mouth from the spice. A very easy recipe to pull off at home and could be a great alternative to the usual super bowl food. Here is the recipe, I hope you enjoy it! Grind the lamb meat yourself making sure you have ice cold attachments for your meat grinder or have your local butcher grind it for you. Add all the other ingredients to stainless steel bowl with the meat and mix well. Take a small saute pan on high heat with a tsp of olive oil and cook 1/2 oz of the meatball mixture. Taste the meatball to see how it tastes. If everything tastes perfect then set aside for the pasta, if not adjust the meatball to what you think it needs to be perfect (more spice? more salt?, more herbs?). Once you have the taste just right, using a wet hand form the meatballs and place them in a large saute pan with 2 tbsp of olive oil. Cook for 4 minutes and then flip the meatballs over and add the onions from the sauce to the pan. Meanwhile in a vitmix blender add garlic, diced tomatoes, water, harrisa, paprika, and salt to it. Puree for 20 seconds. If it is a little bit chunky its okay. After another 4 minutes of cooking the other side of the meatballs pour in the tomato sauce over top the meatballs. Cover the pan and lightly simmer for 30 minutes. Taste the tomato sauce and adjust the seasoning if need be. Simply add a few meatballs to a bowl with sauce. Top each meatball with yogurt. Garnish with dill, a drizzle of olive oil. Serve and enjoy! This is one of the easiest recipes I think I have. This recipe will take about 10-15 minutes to make. It is perfect for winter or summertime when citrus is ripened and the radishes are being harvested from the ground. This is light and refreshing and it will be hard not to eat the whole plate. A great vegetarian and vegan dish that really everyone can love unless you don’t like citrus, and I don’t know anyone who doesn’t like citrus. Here is the recipe I hope you enjoy it! Combine all the ingredients in a bowl and season with salt. Stir together until ready to plate. On a plate add sliced watermelon radishes all around the plate. Season aggressively with salt. Then add the sliced avocados to the plate and season them well. Then add the blood oranges slices to the plate. Take your dressing and spoon all over the radishes, avocados, and fruit. Drizzle the plate with olive oil. Then add the sliced red radishes to the plate and finish with the fresh mint. Season again with a pinch of salt all over and a dash of black pepper. Serve and enjoy! Here is the signature pasta dish from Sicily. I’ve been to Italy several times but never had the opportunity yet to visit Sicily. I look forward to that opportunity if I ever get that chance. In southern Italy a semolina style pasta dough is more common than the northern style with eggs. You can choose whatever dough you are more comfortable with but the one I gave is the semolina style dough. Here is the recipe I hope you enjoy it! Place all the ingredients in a bowl and mix well. Season with salt and pepper and allow to cool to room temperature. Take tomatoes and cut in half. Drizzle with olive oil and salt. Place on the hot part of the grill and grill for 3-4 minutes until charred a bit. Place the grilled tomatoes in a small pot and add cream. Cook for 5 minutes on low heat, then add to vita mix with basil and puree until smooth. Slowly add the butter to the blender until all is incorporated. Season with salt and pepper and keep warm. Place all the ingredients except for the olive oil in a food processor. Puree for 15 seconds and then drizzle in the olive oil until you have a smooth paste. If you want a thicker pesto use less oil to make a thick paste. If you want a more runny sauce use more olive oil. Season with salt and set aside. Place a pot of salt water on the stove and bring to a boil. Place the culurgiones in the water and boil for 2-3 minutes. Strain out and place in two different pans. Place some of the pesto in one pan and place the tomato butter in the other pan. Season with salt and pepper and place in a bowl. Shave a few pieces of parmesan on top. Serve and enjoy! Photography by Wayne Solum. Website by 30 Degrees North.